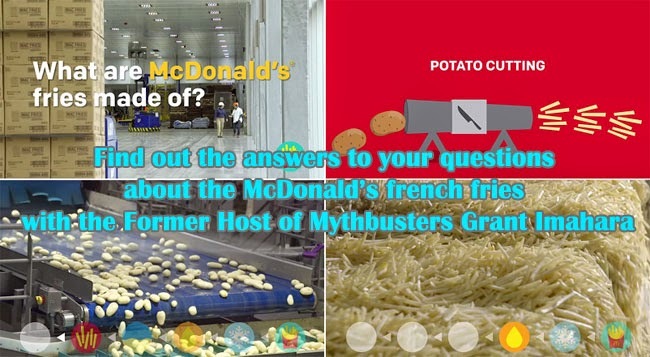 Grant Imahara, former Mythbusters host, journeyed to the McDonald’s french fries factory in Idaho to answer the simple question of how they make McFries and to reveal the ingredients on what makes it one of the sought after fries. Imahara found out McDonald’s ingredient for their fries. The TV host followed the journey of the fries from the finish to start. As an engineer, Imahara builds machines with different components, he felt that it is better to understand something it is deconstructed. As he started his discoveries in the food plant, he asked the question if the fries were actually made of real potatoes or they were mushed up and shaped into sticks. The last stage of the process is the freezing process. The freezer tunnel is 50 yards in length. Before the fries were frozen, they were partially fried. The frying secures the crisp outer shell after it was fried in the restaurants. Prior to frying, dextrose is added to make the fries consistently golden color no matter the season around the year. Sodium Acid Pyrophosphate is also added to prezent the graying of fries after freezing. Potatoes are cut in a machine with high pressure water going through a cutter. The water pressure ranges from 60 to 70 miles per hour. In the restaurants, salt is sprinkled on the non gluten free fries after they were fried for the second time. The large fries serving could have around 510 calories, 24 grams of fat, 6 grams of protein,210 milligrams of sodium and 67 grams of carbohydrates. Apparently Dimethylpolysiloxane is also added in to prevent the foaming of the cooking oil. It is the same silicone in Silly Putty. Yet, Imahara said it is actually safe. To improve the image of the food served by McDonald’s, the company put up a digital series of 'Our Food. Your Questions' in hopes to boost their sales as it had slid in the last quarter of 2014.